On Sale Now! Save 6% on the Innoveda Cognihelth for Brain Health, Memory Support, Focus & Clarity Boosting, Promotes Concentration, Cognition & Mental Performance, Nootropic Supplement, 60 Capsules by Innoveda at Mental Health TN. MPN: 001. Hurry! Limited time offer. Offer valid only while supplies last. Impaired attention and concentration with memory loss leaves one with inability to focus, remember, and makes learning extremely difficult. Impaired attention and concentration with memory loss leaves one with inability to focus, remember, and makes learning extremely difficult. Inattentiveness and impulsiveness are commonly seen in such people. Innoveda's Cognihelth helps to combat these factors through its potent herbal extracts. The antioxidants in the extracts work on protecting the nerves, boosting brain function, activities, and mental clarity, and nourishing the nervous system. This helps improve memory and concentration to a great extent. EXPERIENCING MEMORY LOSS, POOR CONCENTRATION AND LEARNING ABILITIES? Do you often find yourself struggling to remember something, find your attention wandering quickly, or find it difficult to pick up new learning? You can easily remedy these problems through a safe and natural way. 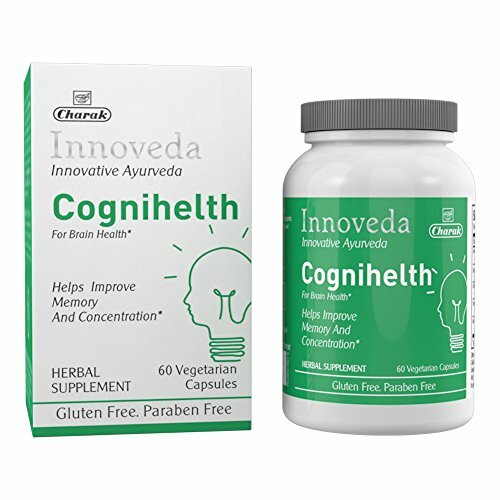 Innoveda's Cognihelth is a unique herbal supplement blended with potent herbs that enhance cognitive functions like memory, concentration and learning abilities. WHY IS COGNIHELTH ESSENTIAL TO BOOST YOUR COGNITIVE HEALTH? Innoveda's Cognihelth, created by Charak Pharma (which has over 70 years of expertise in herbal health-care), consists of Bacopa monnieri, Centella asiatica, and Amla extracts which are extremely effective in boosting brain function and cognitive health to support memory and concentration. Enjoy better memory power, higher concentration level and easy learning ability through a safe and natural herbal supplement. Cognihelth is created using key herbs that are known since centuries to enhance cognitive health and function for improved memory and learning power. Innoveda's Cognihelth is a completely herb-based supplement for holistic brain health, support and functioning. It contains only natural blends of individual herbal extracts free of GMOs, gluten, paraben, yeast, egg, artificial flavors, added sugar or starch, milk and wheat. All ingredients are time tested for their use in promoting brain health. It is a natural, safe and helpful supplement so that guarantees a secure and comfortable purchase for you. 60 vegetarian capsules is a 30 day supply. If you have any questions about this product by Innoveda, contact us by completing and submitting the form below. If you are looking for a specif part number, please include it with your message.